May 19, 2015 ~ Six? Six! 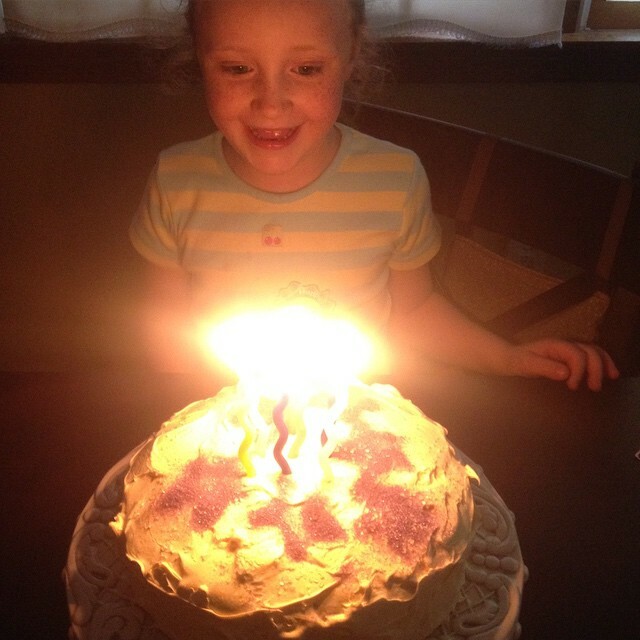 My baby turned six today. I’m not quite sure how that happened. But it did. I worry sometimes about how sweet and sensitive she is. How this could be a weakness, a frailty to be taken advantage of by people who just aren’t kind. 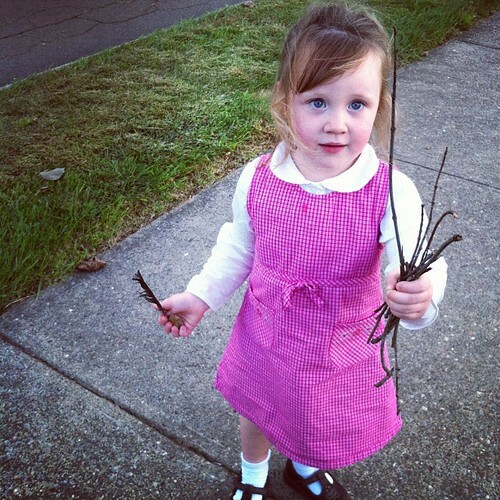 I worry that her classmates in future years will be cruel to her because she wants to give the bus driver a flower. Because she’s nice to someone they don’t believe is worth it. This will be another thing that we put off, for fear of damaging that naïeve sweetness. Eventually, she will need to toughen up, buttercup, and learn how to protect herself. This past year has been a bit rocky, with lots of assessments, and screenings, and meetings, and appointments. Finally, we have something that is helping Teagan be more Teagan, more focused, more there. And more sweet. It doesn’t help with everything, but hopefully, it will allow her to be able to help herself, something that was beyond her young abilities. She’s become a world class snuggler. I love that. And I love her freckles. And green eyes. And smile. Happy birthday to my lovely little big girl. I can’t believe how far you’ve come. More: Five. Four. Three. Two. One. New. Today was a better day. Finally. I think it’s been at least a month since we’ve had 13/14. 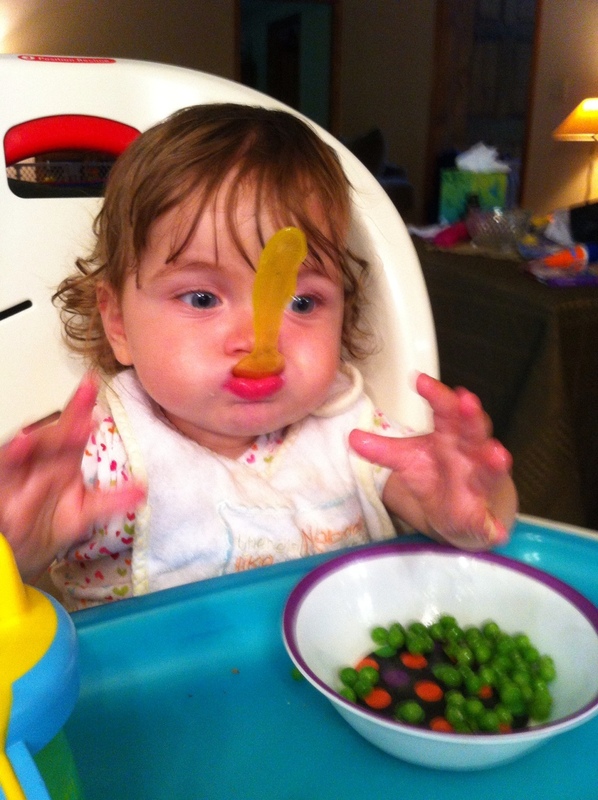 We celebrated by taking her out to the dinner of her choice – she chose McDonald’s for the toy and the play place. I know I don’t write much about Teagan’s troubles in kindergarten. It makes me uncomfortable to complain about the issues we’ve been having. What we’ve tried, what worked – if only for a little bit. Most of what we try doesn’t have much success. It’s frustrating. I don’t like failing, failing her. I know eventually we’ll get it all figured out, but in the meantime, we celebrated our good day. Our little victory. September 18, 2014 ~ Fuzz! Waiting for Teagan’s bus this morning was lovely. I had a full cup of coffee, Ashlin was in sandals and her jamamas. 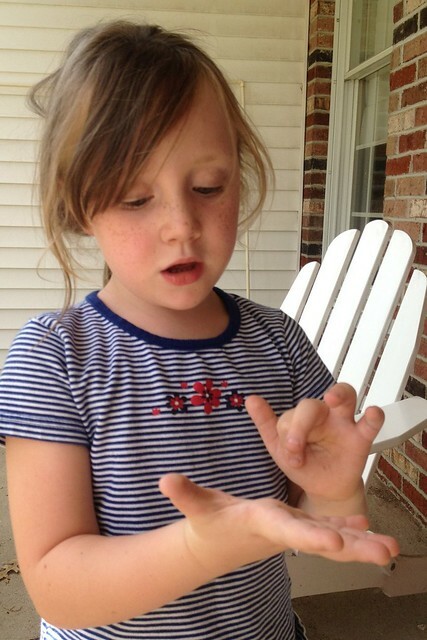 Teagan was happy, going like a pinball from one thing to another – a bug, a leaf, a dandelion puff. The sun was smiling down, warming the day. 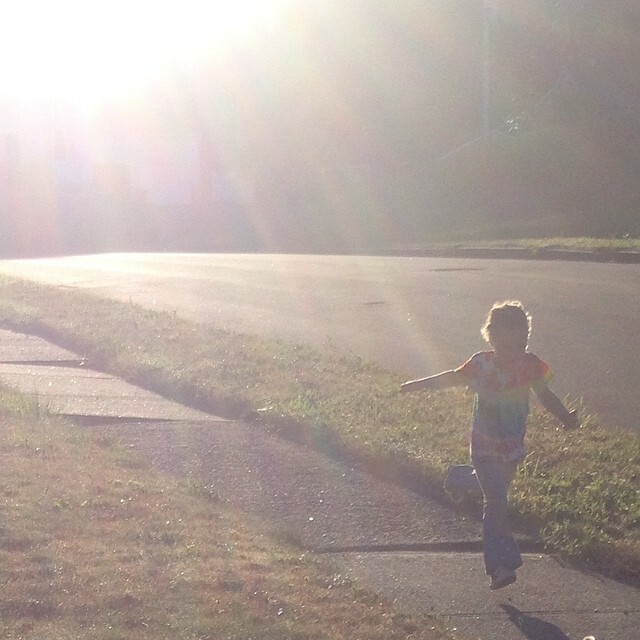 A friend said that Teagan looked like she was walking on sunshine, filled with joy. This morning she was. There wasn’t any apprehension about going to school, or what may happen there. There was only joy with being able to run around, to watch the grasshopper jump and startle her sister, to make snow angels on the driveway, though she told me yesterdays were better. Kindergarten has been rough for Teagan. 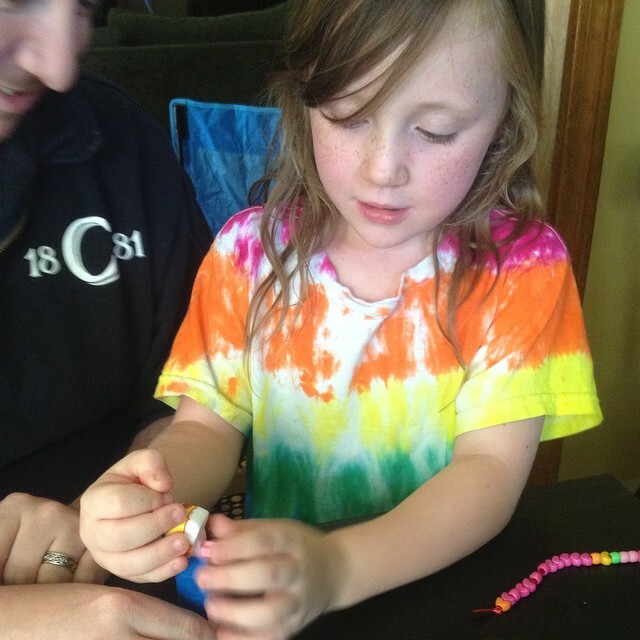 But we’re getting there, getting it all figured out, trying to get her the help she needs to help herself. Today was a good day – she stayed green for the entire day. No yellow or red behavior. Green. The teacher had sent me a mail letting me know. Teagan basically flew off the bus and up the driveway to tell me herself. The look on her face was one of the best things I’ve ever seen. She was so proud that she didn’t have any troubles today. She had to immediately let Stu know, and promptly got a huge bear hug from him. We went inside and gave her her reward – the promised “fuzz.” She’s been waiting for a green/no issue day so she can load the Jessie dispenser full of Pez. Today, she earned it. And then promptly shared with her sister. In the car Teagan saw a bug of some sort, which she dubbed a cricket. She then went on to tell me that it was crawling on her hand, but when they do, they kiss you when they crawl on your hand. With their feet. One day when I had to leave early to work in Jersey, I left a note for the girls, and Stu. On it I asked Teagan to be a good girl at nap time (we are still having issues – sad face), and gave everyone hugs and kisses. Ashlin asked Stu for the paper, saying “ugg! Ugg!” and then kissed the paper. Ashlin cannot leave day care, or anywhere else for that matter, without hugging everyone she knows goodbye. She also can’t walk past an open door without closing it. On my drive home from Jersey the other day, Alt Nation played Josie Cotton “Johnny Are You Queer” and I had flashbacks of teasing my friend Tom incessantly. I’m not sure exactly why the song bothered him, but it did. My sister also joined in when she was out and the song came on. I miss Tom. He’s moved too far away from some of his friends and we don’t see him enough. 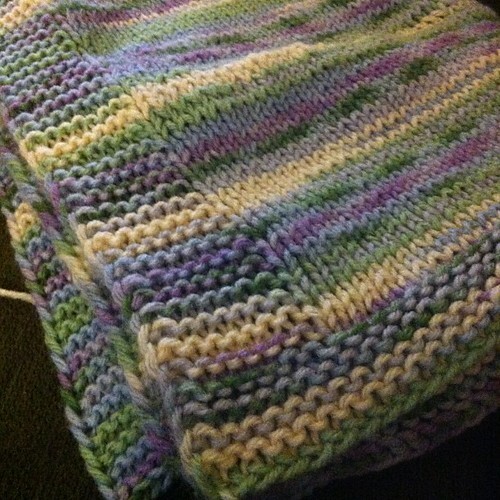 I finished Ashlin’s car blanket last night, the blanket portion anyway. I used a crochet bind off, which was easier for me to control the tension, and the cast-off stitches look much better, looser, than those of the scarf. I will need to work on that. The button hole on the strap is throwing me for a loop – not a hole – unfortunately. I will get it figured out. Soon. I’m sure it has something to do with my mirror knitting and Eastern European style. I moved on to the crocheted shawl for the time being. This isn’t the first time we’ve gotten a report like this. It is the first time we’ve gotten three in a row. Three days! Gah! 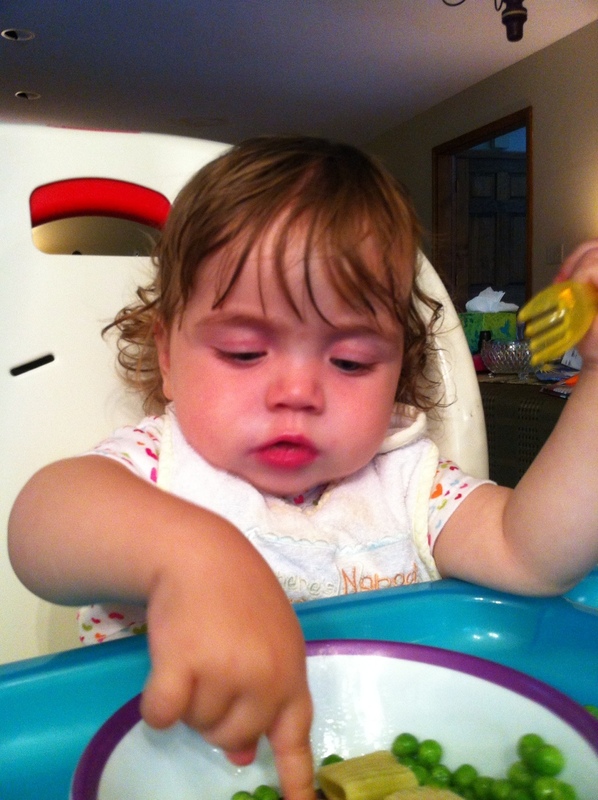 We’ve spoken to Teagan before about how she needs to be quiet at nap time, even if she doesn’t nap. About how she can ask to read a book quietly, if she doesn’t want to nap. Letting her know that the teachers will let her read a book quietly, if she doesn’t want to nap. She wasn’t quiet. Three days in a row. I’m not sure where she decided that yelling at the other kids who are trying to nap was a good idea. She’s run around at nap time, singing loudly (she likes to sing*, she’s jumped on other kids cots. Bad, bad. We’ve talked to her too many times about this. 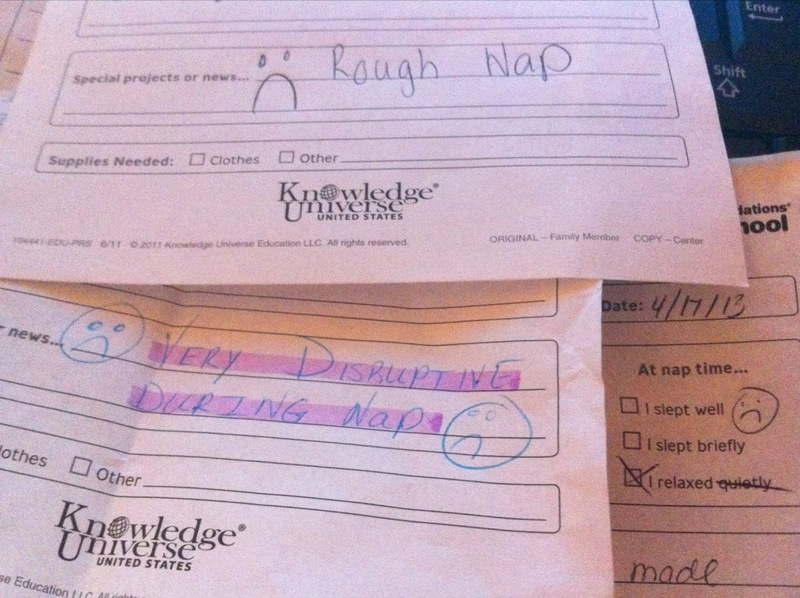 We’ve told her that she doesn’t want to nap that’s fine, but she doesn’t get to make that choice for her classmates. Yesterday, after the purple highlighter and double unhappy faces, she was told that she’d lose her music at bedtime if we got another one today. Today, we got the third unhappy face for nap time in a row. Tonight, Stu took away her cd player and box of cd’s. No music at bedtime for her to go to sleep with. Stu said that she was mildly curious when he unplugged the cd player, but lost it when he picked up the box of cd’s. That’s when it hit home. She will have no music at bedtime for a week (which she believes is only six days, but that’s another story). A week may be a bit too long for a kid her age, but that’s what she was told the punishment would be. She’s promised to be better tomorrow. Stu told her as he tucked her in, that if she got a smiley face that she could have her music back tomorrow night. 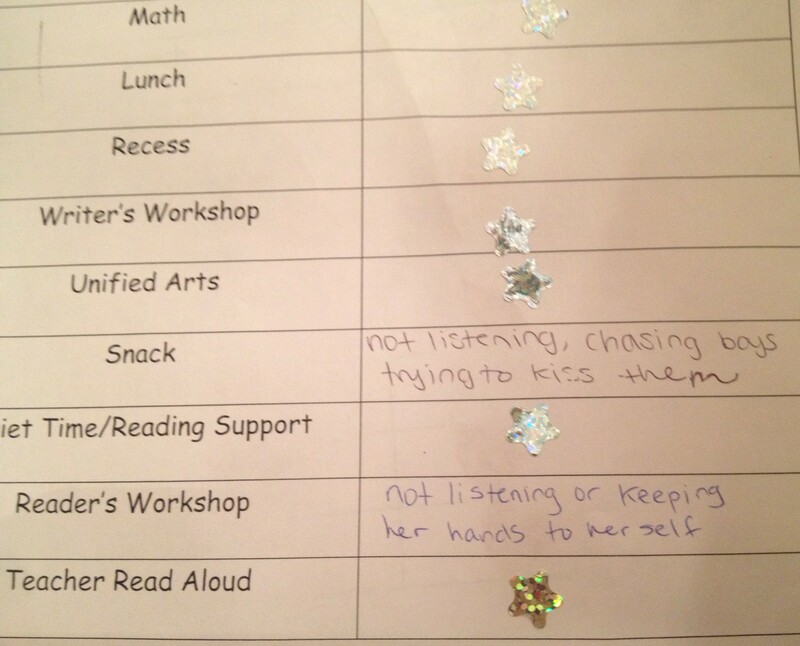 We are going to say something to her in front of the teachers about how she needs to be good, especially at nap time. We are going to let them know that we need to know how she behaved, that she’s gotten in trouble and could have her punishment reduced if she’s good. Fingers crossed she’s good. She can be so good. She’s fun when she’s good. I hate being mean. It’s not any fun at all. * One time at lunch she was happy so she started singing. Unfortunately, she chose to sing Cellphone by Beck. The other children found the riff “One by one I’ll knock you out!” a bit disturbing. She was also a nightmare, again. A very bad girl. Today at nap time, she pulled her pants and underwear down and danced on her cot. Wonderful. My girl is going to be a stripper. Not an encouraging thing to hear from the instructors today. Teagan did not get a cookie after dinner tonight. 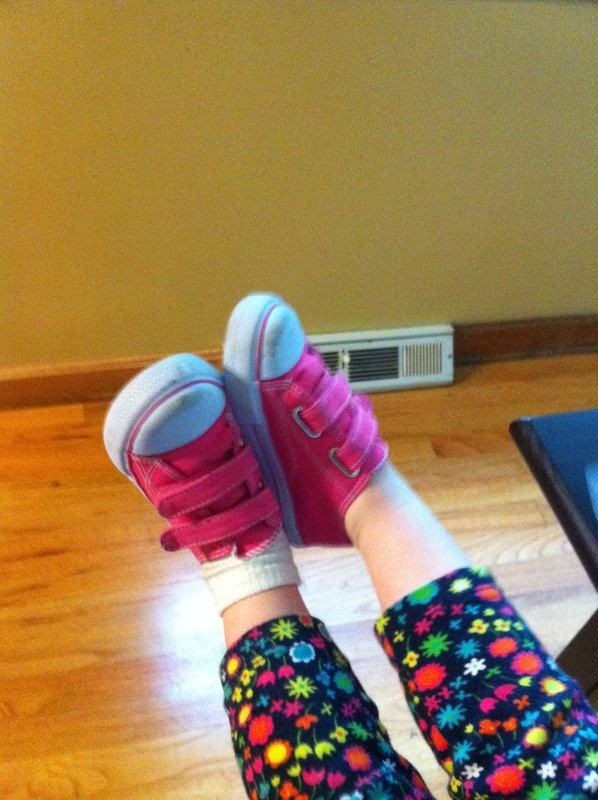 Oh, and she’s not going to be wearing her pink sneakers to day care tomorrow. 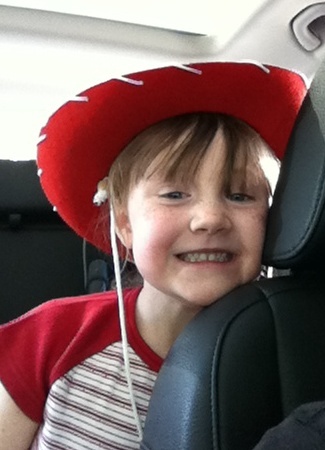 Ashlin, on the other hand, had a good day. She spent most of the day, including her nap, in the toddler room. It’s not her first time, they’ve had her visit on and off for a few weeks now. And she loves it there. Mornings lately, she does not like being dropped off in the infant room, and will try to get into the toddler room. She’ll walk up to the half door, and hold her arms up, until someone comes and picks her up and brings her in. She also tried to let herself in. (She’s going to be trouble.) There must be something magic about the table over there, she loves eating her breakfast (pancakes, or waffles, or a bagel), at that little table, in her own little chair. I think they’ll be moving her over soon, she’s ready. I’m not sure I am. Also, no bumps or scrapes today for her. Yay. 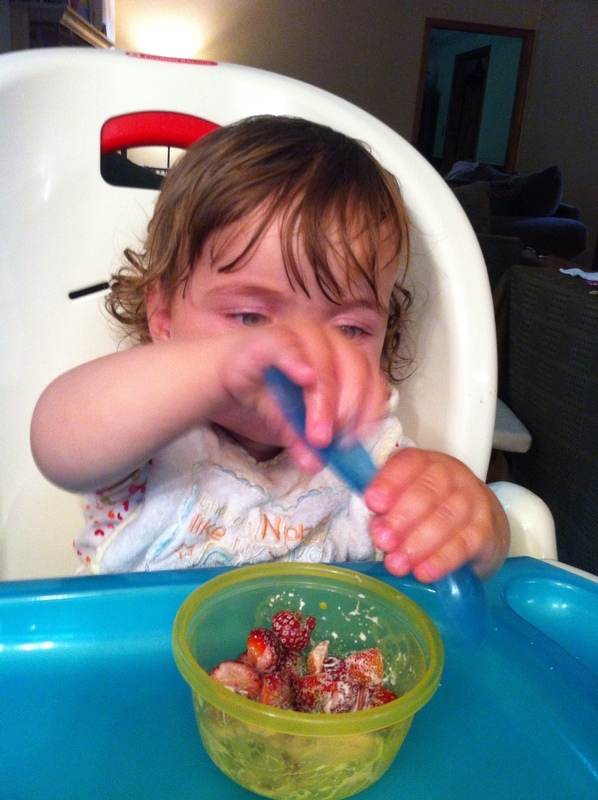 And tonight, she did great with her fork.